Sure, the Bay Area has stupendous views, not to mention weather that makes most of the country insanely jealous. 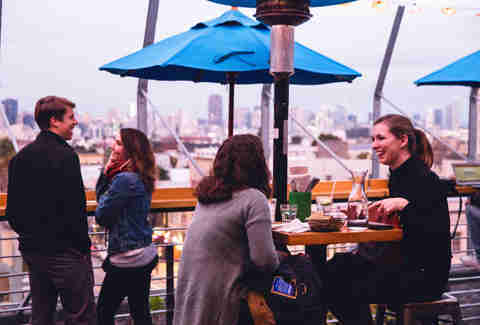 But when it comes to taking advantage of these resources, we tend to relinquish the waterfront decks and Bay-side bars to tourists sporting “San Francisco” sweatshirts. 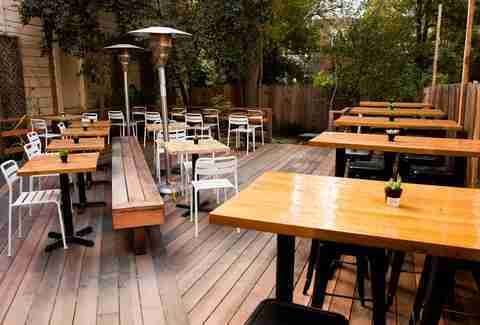 But San Francisco has some excellent rooftop respites, heated patios, and backyard beer gardens, all ready for you to soak up the sunshine. Here are a few of our favorites, but be warned: you will almost definitely need to make reservations for Sunday brunch at pretty much any of these spots. While the food here is award-winning (try the seasonal, organic 'Pop Tarts' -- yes, really), this space is nearly as famous for its outdoor movie screenings. Check the movie schedule to see what is going to be projected onto the wall during your next meal. Laszlo Bar, which overlooks the courtyard, is currently closed for renovations, but its as-yet-unannounced reopening sounds like a perfect time to celebrate with a visit. Hayes Valley has become the go-to neighborhood for trendy spots, so it’s no surprise that there’s another favorite for outdoor eating around the corner from Biergarten. 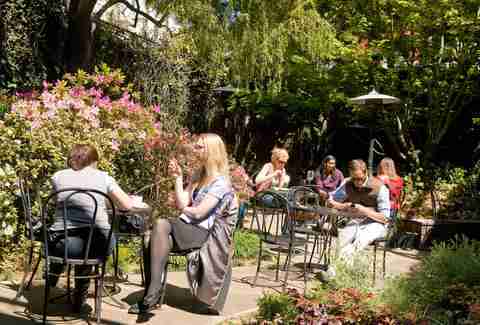 Proximity is about all these two spaces share, however: Arlequin Cafe, which is wedged between upscale sister restaurant Absinthe and the connected Arlequin Wine Merchant, is a secluded, lush garden patio. Surrounded by trees and filled with small tables hidden under the leaves, it’s a surprisingly pretty spot to snack on something from the cafe, or drink the bottle of wine you just bought from the wine shop next door. 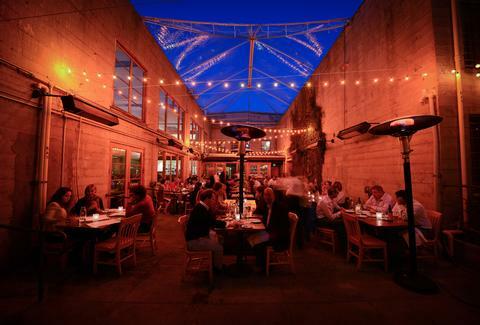 Biergarten is the big shot of outdoor drinking in San Francisco -- an impressive feat, considering it only opened in 2011. As you’d expect from the owners of nearby Suppenküche, this place offers authentic German food with, um, some American influences -- expect brats and pretzels alongside items like banana-and-hazelnut butter sandwiches. Order at the counter, then grab a seat at one of the picnic tables. The beers and dishes change, so you’ll just have to keep coming back. 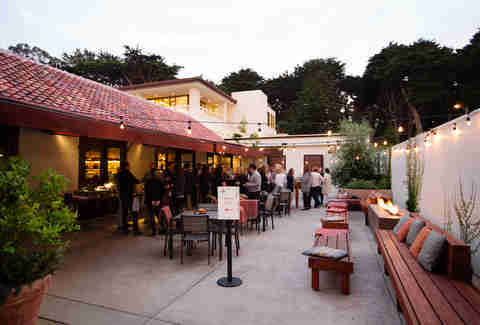 The Presidio can seem a little off the beaten path, but Arguello is a great place to stop in after a jog around the park’s trails or a walk through Crissy Field. Chef Traci Des Jardins opened in late 2014 in the remodeled Presidio Officers' Club. This is the the kind of spot you take a date or a visiting parent you want to impress, with food prices to match. Sit by the fire pits on the patio and sip your margaritas or mescal cocktails -- a house favorite combines chocolate, orange, and mescal -- while enjoying the outdoorsiness of it all. There must be better air on this particular block of Mission St, since right next door to Foreign Cinema is El Techo -- another outdoor deck populated by locals. Located on the rooftop of Argentian steakhouse Lolinda, this place provides great views of the city through the glass wind wall. During breezier nights, you can sit under the heat lamps or in the heated tent while you sip margaritas and snack on Latin American street food. The story is that owners Amy Brown and Joe Wolf loved the backyard garden at their new bakery so much, that they got married there before opening the doors to the public in 2014. The duo, who met while working at the famous Nopa, serve breakfast, brunch, lunch, and monthly Sunday Suppers -- which you’re going to want a reservation for. Take your food to the backyard garden to sit among herbs and fruit trees, both of which are used in the garden. While Marla now has a Ferry Building location, hit up the original Outer Richmond one for peaceful outdoor snacking. The thing about beer gardens is that so often they’re just, you know, totally sticky with spilled beer. Sparrow is the high-brow San Franciscan alternative, serving a classic new American menu -- think Marin Sun Farms burgers, and local goat cheese served with roasted beets. The idea is that you can sit in the sun, enjoy some not too terribly expensive food, and sip a beer... if that sounds pretty solid, sadly, a lot of other San Franciscans agree with you: although the weekend brunch line is getting predictably long. Plenty of people just come for the drinks, however: you’ll frequently find rare West Coast beers on tap and a range of California wines. 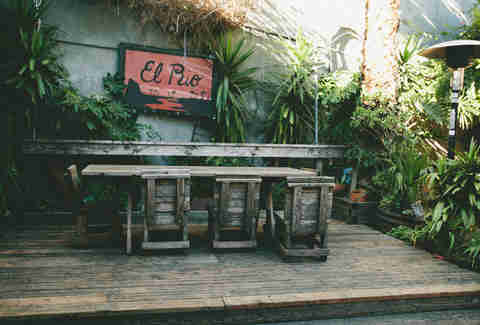 Considered a staple of San Francisco gay bars since 1978, El Rio is one hell of a dive. There’s almost always a party going on in the overgrown quirky backyard patio, even if there’s not actually an event scheduled that night. The bar also has pool tables, shuffleboard, visiting cats and dogs, and salsa dancing. Plus, there are free oysters every Friday at 5:30pm (but get there before they run out). Bring cash for everything else; credit cards are definitely not accepted. 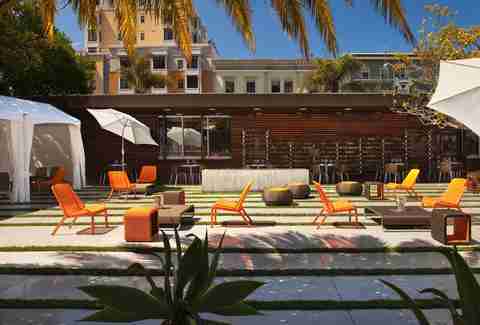 Located inside the Phoenix Hotel, Chambers is the closest to an LA poolside scene in San Francisco. They’ve got poolside chairs, cabanas, and bar tables. The whole space is opulence of the highest order, right up to their lit “Be Amazing” sign. If you’re looking for a big night, order the tri tip or pork belly, or if it’s more of a lounging by the pool day, the drink menu is long and inventive. Why not start at the top and work your way down?